Learn How to Make 2D Games for iOS, tvOS, watchOS and macOS! Learn how to make games for all the major Apple platforms in Swift, using Apple's built-in 2D game framework: SpriteKit. Through a series of mini-games and challenges, you will go from beginner to advanced and learn everything you need to make your own game! By the time you’re finished reading this book, you will have made 6 complete mini-games, from an action game to a puzzle game to a racing game! Sprites: Get started quickly and get your images onto your screen. Manual Movement: Move sprites manually with a crash course on 2D math. Actions: Learn how to move sprites the “easy way” using SpriteKit actions. Scenes and Transitions: Make multiple screens in your app and move between them. Camera: Use SpriteKit’s built-in camera to control your view. Labels: Learn how to display text for lives, score and more in your game. Physics: Add realistic physics behavior into your games. Beyond Sprites: Add video nodes, core image filters, and custom shapes. Particle Systems: Add explosions, star fields, and other special effects. Adding “Juice”: Take your game from good to great by polishing it until it shines. Online Gaming: Add multiplayer features to your game with Apple’s Game Center. Tile Maps: Make games that use tile maps with obstacles, power-ups, and more. tvOS: Learn how to port your game to the Apple TV and work with the remote. watchOS: Take advantage of the unique features of the Apple Watch. 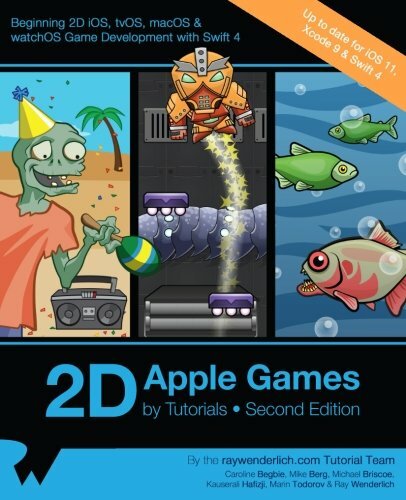 macOS: Learn how to bring 2D gaming to the desktop. And much more, including bonus chapters on augmented reality in ARKit and creating your own 2D game art!